On the afternoon of December 13th, Professor Santa Ono, President of University of British Columbia (UBC), and his delegation of three members visited SWUPL. They were given a warm reception by SWUPL President Fu Zitang. From November 24th to 25th, the 9th National Legal English Contest was held at the Changping Campus of China University of Political Science and Law. 3 student representatives of SWUPL, went to Beijing and participated in the contest. From November 28th to December 3rd, the third"Learning the Constitution and Discussing the Constitution" National University Debate Competition hosted by Ministry of Education, was held in Beijing. Recently, China Law Society released a series of project approval announcements on 2018 Ministerial Level Law Research Projects (later funded projects and annual projects). 30 projects of SWUPLin total were approved to be set up. 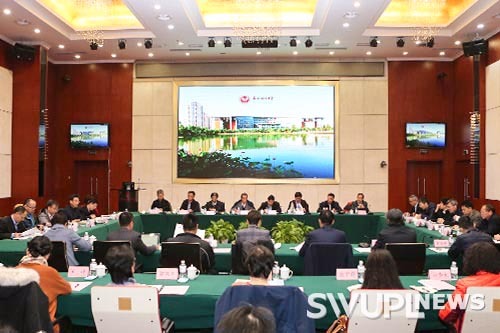 On November 15th, the opening ceremony of 2018 SWUPL international master and Ph.D. programs were held in China-ASEAN Legal Research Center. the review results of major projects, major research projects, annual projects and later funded projects of the National Social Science Fund in 2018 were announced. From November 9th to 11th, the 2nd Student International Program Promotion Event was held in SWUPL. Dean of Temple University School of Law Professor Gregory N. Mandel visited SWUPL.